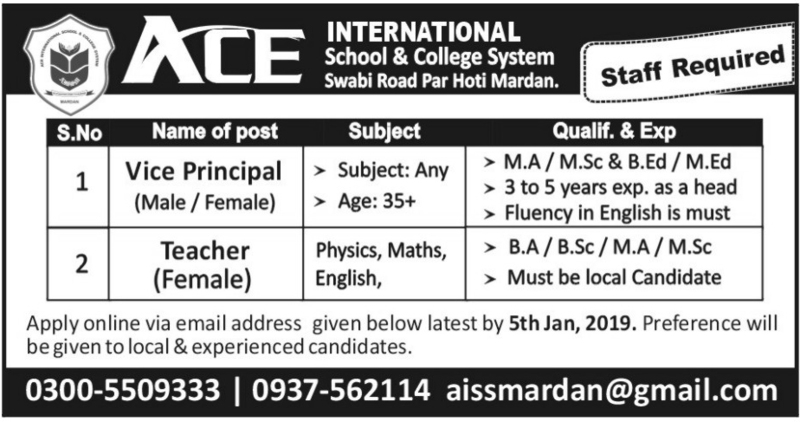 Below are the complete details of the Vice Principal jobs in Ace International School & College System in Mardan. Skills Required for Job: Having Good Communication Skills. Having Good Team Working Skills. Effective communication skills. Problem-solving skills. Strong interpersonal skills. Critical thinking skills. Good judgment. Qualification: Ace International School & College System Mardan Jobs For Vice Principal. Required Qualification: MA/ M.Sc/ B.Ed/ M.Ed from Recognized University/ Institution. Having 3 to 5 Years Experience in the Relevant Field. Attractive Salary Package. Last Date for Submission of Application 15th January 2019. 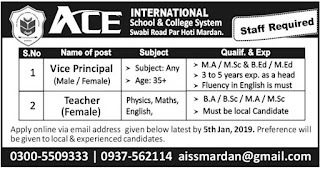 Vice Principal jobs in Ace International School & College System Mardan, in Pakistan published on Paperpk.com from newspaper on December 29,2018. Job seekers who are already working as Vice Principal , Principal can also apply for post of Vice Principal.